Well the petite peek into this peak 3930ft above sea level was just an illusion- it is considered to be the second largest monolith in Asia. 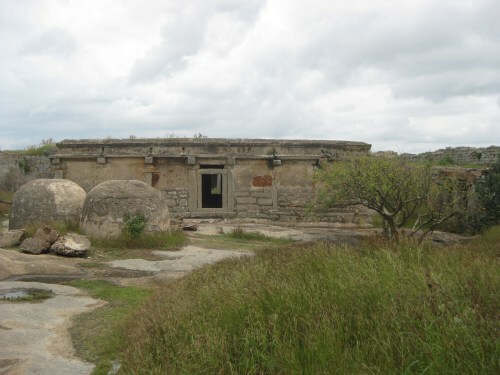 The fort accredited to King Hyder Ali and King Tipu Sultan lies on the slopes of a giant stone. 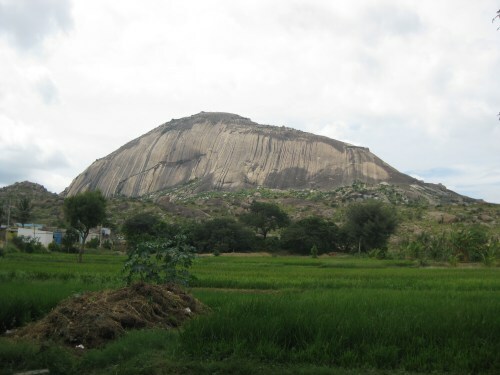 Located almost 43km north of Tumkur town and 107km northwest of Bangalore, we drove on the Bangalore-Tumkur highway across Dobbespet towards Madhugiri. 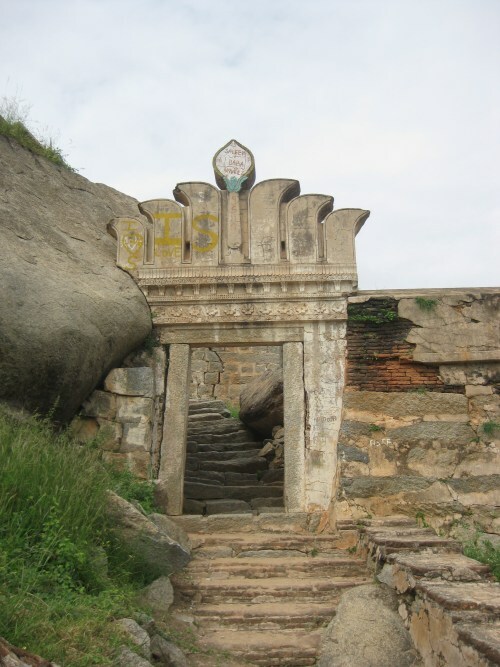 There lay three gateways of the majestic fort-namely Antaralada Bagilu, Diddibagilu and Mysore Gate. Surprising as it seems, there are stairs of stone slabs in place for at least the initial 200 meters. Huge boulders lie around everywhere along the path that was relatively easy for the climb. Gradually the steepness of the slopes kept increasing. 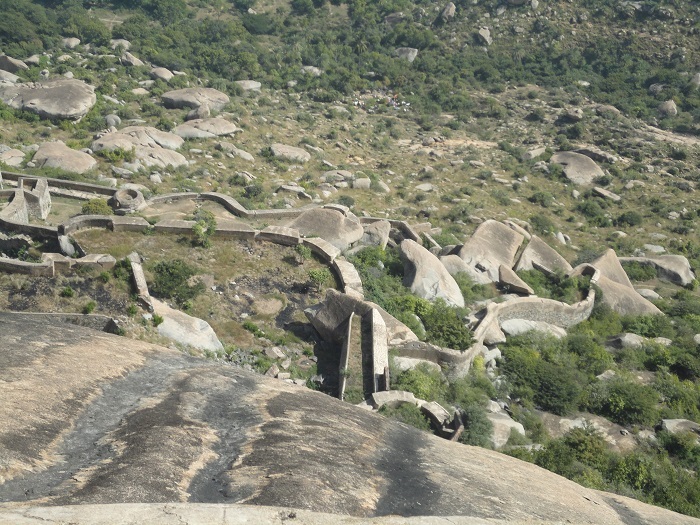 Stairs were now replaced by carvings in the boulders which act as footholds. A little further into the walk, the steepness does increase drastically. 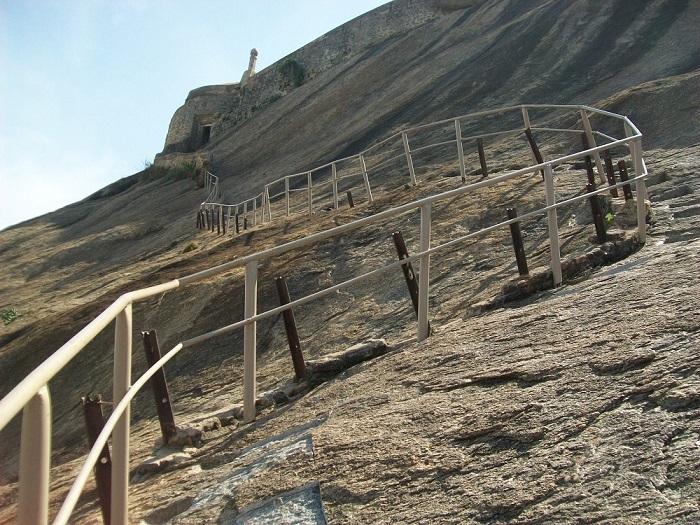 As a measure of safety metal railings are provided for the climbers to hold onto. Almost making up to 10 levels this fort, at each station showcases some of the amazing views of the surroundings below -ranges of distant hills, settlements below and miles of open meadows. Inside the fort, there are secret passage ways at some levels. Little temples, long parapets and small doorways- all had their own architectural brilliance. The outline of a part of the fort. As we inched closer to the summit, the path got more perilous. 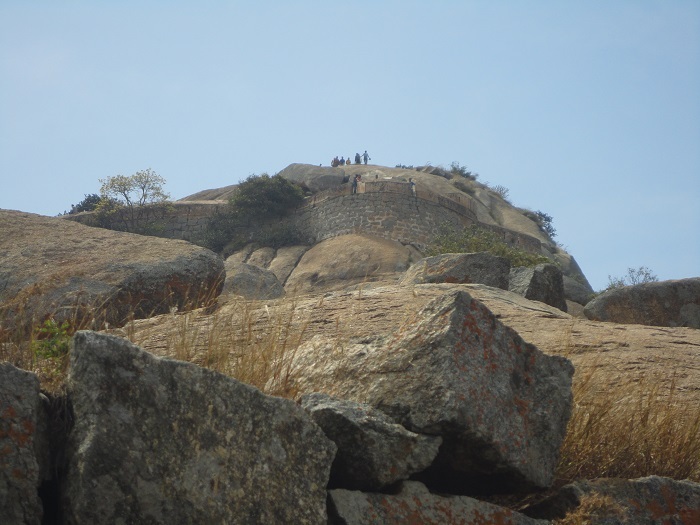 Slopes of nearly 70 degrees, no support railings, no steps carved out- basic rules of rock-climbing had to be adhered to. As we sweated it out and reached the peak, a sight to behold and a sense of satisfaction took over. 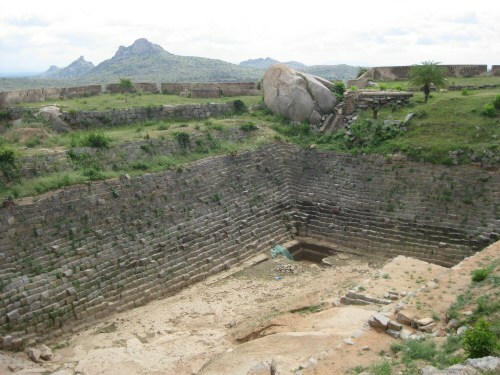 A ruined temple of Gopalakrishna is located at the top. 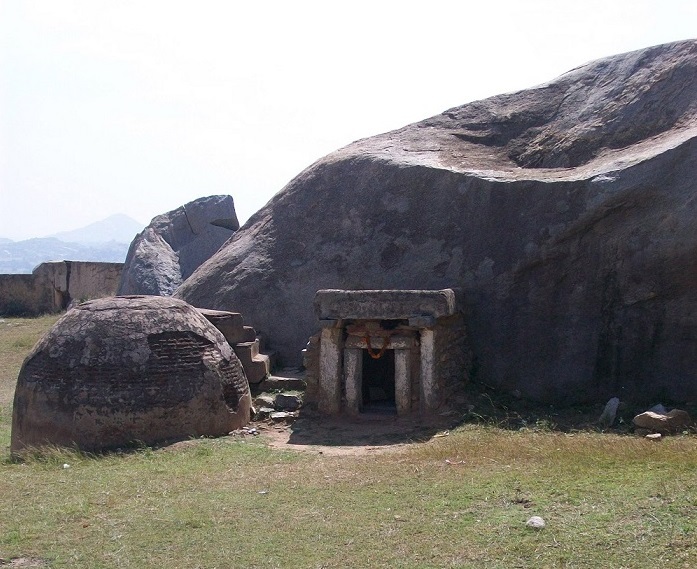 Stone pillars, long staffs and some architectural splendor awaited anyone who had made it that far. The summit overlooked lands that looked so meagre. I wonder what a feeling it was to be a ruler and stare down at the world below. A world filled with green lands, spread out hills and a land that he claimed to be his own. Descent? Well, the six of us just ran downhill, slipped at times, and slid at times. Making down in good time, we had covered the total up and down journey of almost 4kms in just over 4 hours. As evening grew and day-light almost disappearing quickly we drove back into the eventful city of Bangalore. 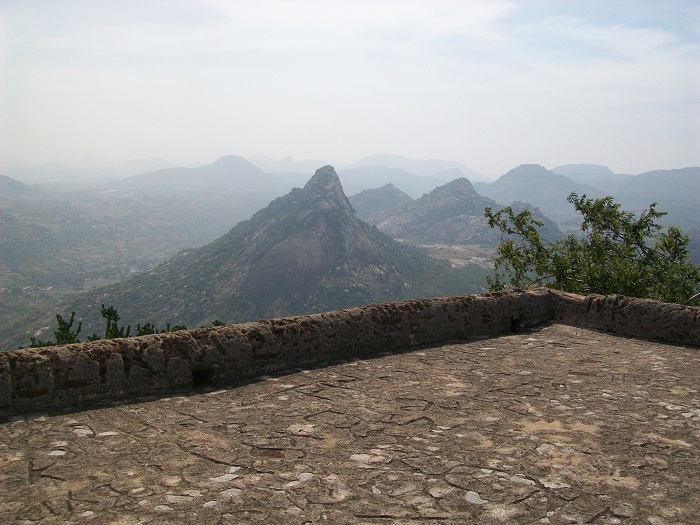 A day that had started off when the busy Bangalore populace was still blissfully asleep and we were driving up the Nandi hills, following it up with this little rock-climbing adventure had soon drawn to a closure with beautiful memories and sore legs. Well, they say days like these don’t come in every day. We just have to remind ourselves of moments spent with the best people we know and live on with it.